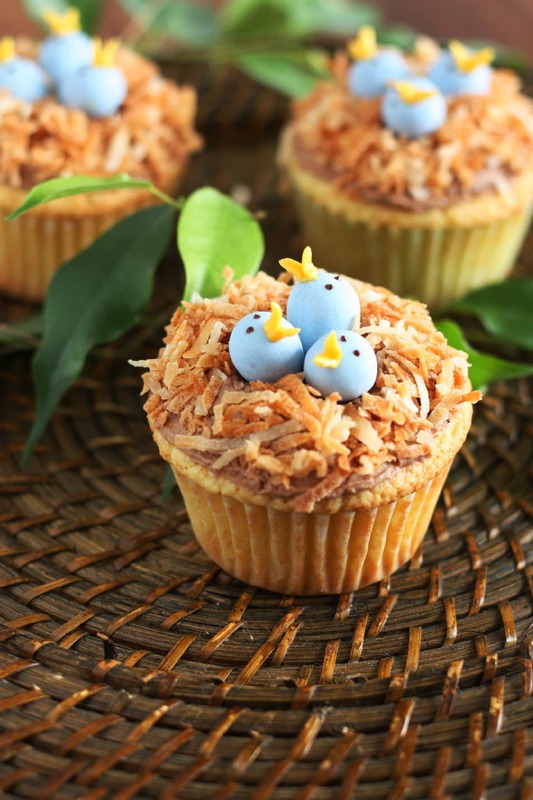 Bird’s Nest Cupcakes are the perfect Easter treat! I’m like a little kid on Christmas morning full of excitement over these cupcakes! Are they not so fun? These are one of my favorite blogs posts yet. My daughter and I had so much fun making these, and she like me was thoroughly ecstatic over them. I also need to tell my husband thanks, he came home yesterday with a bag of Mini Cadbury Eggs and I was like noooo we already have so much candy in the house I don’t want more candy around for the kids (and me, to be tempted by). Anyway, I saw these cupcakes when browsing my favorite food sites and it clicked, why not use the blue Cadbury Mini Eggs instead of frosting? They are easier, they hold up better and they are one of the best, creamiest chocolate candies of all time. Don’t ever give me a bag, because it’s likely I wont share with you =). 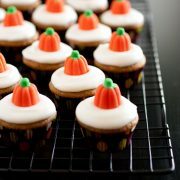 These cupcakes are enticingly delicious! This is definitely a recipe I will be using often. The cupcake is moist and perfectly tender. I made the frosting to be a gentle and not overbearing chocolate flavor so they compliment the vanilla cupcake and toasted coconut perfectly without screaming for all the attention. Another important factor the chocolate frosting plays is how it’s color matches the toasted coconut wonderfully. 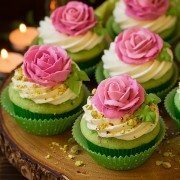 I hope you get a chance to make these cupcakes this spring and possibly even for Easter. They are sure to put a smile on the face of any lucky person who gets one. 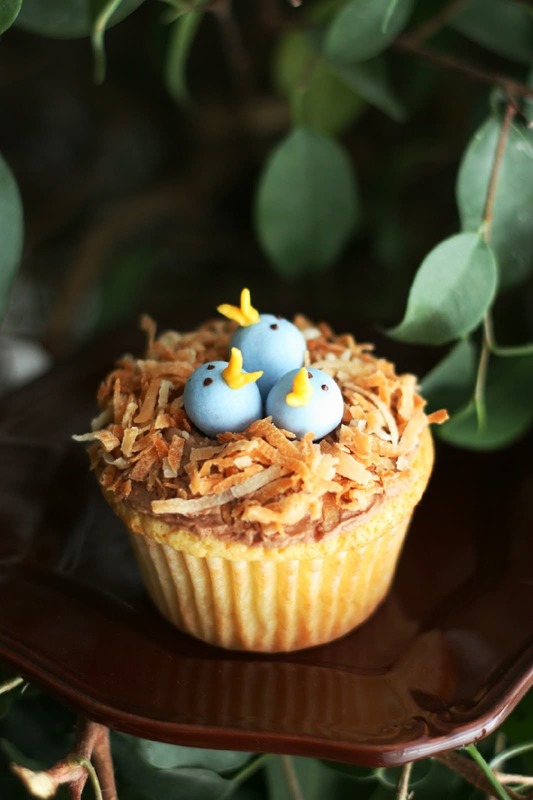 Perfect fun and delicious cupcake that's perfect for Spring and Easter. 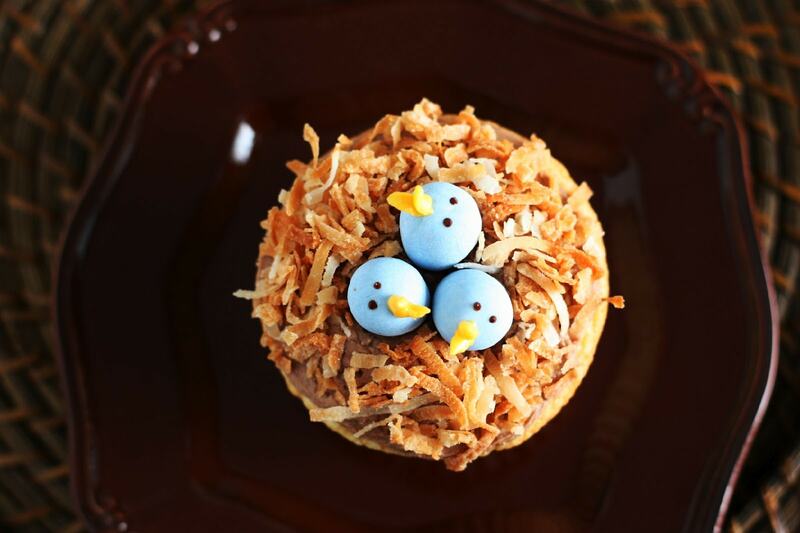 Made with tender vanilla cupcake, creamy chocolate frosting, toasted coconut and decorated Cadbury egg chocolates. Prepare cupcakes according to directions listed, allow to cool completely. Then toast coconut by preheating oven to 350 degrees. Spread coconut onto a cookie sheet and bake in preheat oven for 8-9 minutes until golden brown, rotating pan halfway through baking and watching closely to prevent over toasting. Allow to cool. Prepare Chocolate Buttercream Frosting as well as the orange tinted frosting for beaks according to directions listed. Frost cooled cupcakes with Chocolate Buttercream Frosting. Gently press 3 blue Cadbury Mini Eggs into the center of each cupcake with the pointed end facing down (larger rounded side should be facing top). Sprinkle toasted coconut around the Cadbury Mini Eggs on each cupcake (try to work quickly doing this before the frosting sets up so the coconut sticks better). Fill a ziploc bag with orange tinted frosting, then using scissors, cut a very small tip off the edge of the bag and pipe beaks onto Cadbury Mini Eggs (you can practice first on a plate, in the recipe I made it so there's enough for practicing. Also, you can use a toothpick as a "paintbrush" for mistakes). Melt chocolate chips in a microwave safe bowl in the microwave in 20 second intervals, stirring after each interval until melted and smooth. Using a toothpick, paint eyes onto the chicks with melted chocolate. Store cupcakes in an airtight container. Enjoy! *It's likely will need to purchase two 10 oz. bags of the Mini Cadbury Eggs if you want to do all blue chicks, otherwise if you only want to purchase one bag you could do half blue and half pink for the girls (or yellow or white). I had enough blue from one 10 oz. bag to make 7 cupcakes with blue chicks. Preheat oven to 350 degrees. In a large mixing bowl, whisk together flour, granulated sugar, baking powder and salt. Add in butter, egg, egg yolks, vanilla and sour cream then beat ingredients together with an electric mixer on medium speed for 30 seconds until mixture is smooth (don't over-mix, if necessary, using a rubber spatula stir the batter until the flour is fully incorporated after the allotted 30 seconds). Divide mixture evenly between 12 paper lined muffin cups (they should each be about 2/3 full). 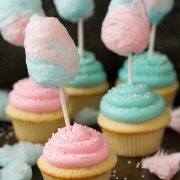 Bake cupcakes for 20 - 25 minutes, until lightly golden and a toothpick inserted into center of cupcake comes out clean. Allow to cool completely before frosting. *Original recipe calls for unsalted butter but I make mine with salted butter. In a large mixing bowl, using an electric mixer, whip together powdered sugar, butter, cream and vanilla for 1 minute until very smooth and fluffy. Scoop out 2 1/2 tablespoons of the frosting (without cocoa powder) into a small bowl and tint it with yellow and red gel food coloring (you won't need much and a tiny bit of red goes a long way so take it easy with the coloring). Add cocoa powder to remaining non-tinted frosting mixture and using electric mixer, whip until well combine.